The Parisians have a wonderful secret. The artists who paint in the Marais, the businessmen who catch the Metro to work, the college students who walk to class all share these hidden treasures. These venerable parks, these uncovered parks and gardens and squares of Paris are growing in number and size every year. This book is about them. To reveal the best hidden parks of Paris is to uncover a secret oasis right within your reach. 27 million tourists make their way to Paris each year. Most will visit Le Louvre, Eiffel Tower, Saint Germain, Arc de Triomphe, and Sacré Cœur. But just how many of those travelers know that there are over 400 parks nestled between the boulevards and alleyways, tucked beside buildings, and hovering above the city in a promenade of green? The Hidden Parks of Paris is the first-ever travel book on the parks of Paris. 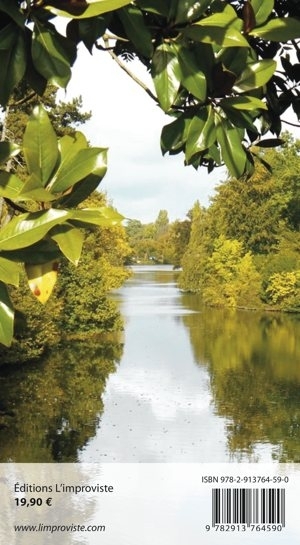 The authors have taken the time to uncover the best hidden parks of the city, writing thoughtful, earnest reviews that detail just what’s inside each park. This book includes essential travel tips, transportation information, and dozens of stunning photographs. There are parks that feature free Wi-Fi, playgrounds, panoramic city views, lakes, waterfalls, islands, ancient ruins, and much more. All of the guesswork into where these parks are located has been taken care of. If you’re staying in the seventh arrondissement, for instance, in Saint Germain, and are looking for a quiet park with a playground, free Wi-Fi, water fountain, and is perfect for a picnic, you can locate your hidden park within seconds by referencing the beautiful, easy-to-use icons. All reviews include the park address, GPS locator, creation date, and nearest metro stop. To be surrounded by friends in a hidden park in Paris is to discover the serenity and wonder that the Parisians have come to call their second home. Each park has its neighborhood locals, keen to share a good story, have another coffee, and stay the afternoon with friends and loved ones. 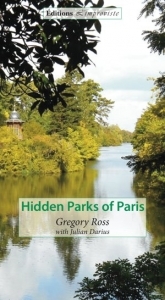 Purchasing a copy of the Hidden Parks of Paris will provide you the opportunity to visit over 100 parks; or if pressed for time, you can explore the author’s top five hidden parks. The Hidden Parks of Paris was written for everyone, but especially crafted for those travelers seeking to experience another side of the City of Light. It is a hideout. A stream crumbles down the rocks. A wood- en footbridge passes overhead. Archways made of stone with overgrown ivy reveal a sinuous passage to a pond with orange-speckled fish. Wooden benches are tucked in al- coves of rocks that and are concealed beneath branches and twisting vines. This is Swiss Valley, located off the Champs-Élysées, hidden in a cappuccino of green. It is a place designed to disappear into, to be enveloped in a tapestry of leaves. The plants have taken over. The gardener has gone home. It is a place ripe with stories to tell, of the writers and artists who stood below the branches of contemplation. The infinite stream. Listen and it will sing. It flows cooly in the background and absorbs the noise from blocks away, where the cars and trucks pass by. Bees dance in the sunlight. Through the wilderness, you will see the towering white pillars of Palais de la Décou- verte. Office workers make their way down the steps to have a smoke, drink a coffee, or often, both. This park is the reason why this book began. It is the definition of hidden. To walk amid the maples, lilacs, bamboo, drooping flowers, to smell the sweetness in the air, to listen to the flow of water in the background reminds me why I created this book in the first place. It’s about wonder. It is about the hidden places in plain sight. The shadows creep over the vines at just the right hour, when the sun is beginning its slow decent into the river. This park is an enduring gift to the city of Paris, a garden that is frequented by more species of birds than by foot traffic. To appreciate the full effect of this park, enter on avenue Franklin-D. Roosevelt, where a miniature white statue of the Swiss Alps rests beside a mountain of green. Roman columns are planted like tree trunks beneath the vines. Find the stone staircase that looks like it has no earthy reason in being there. Walk under the stone archway and look at what wilderness you have discovered.